Double-sided scanning of documents from business-card size all the way to A3 can be done with a single scan. Plus, double-sided scanning is done at the same speed as single-sided scanning. This eliminates the work of pre-sorting, and prevents pages from being missed when scanning. Documents with different sizes and thicknesses can be fed together. They can be centre, right or left justified. By using left or right justification, there is no more need to spend time organizing documents according to their size, so scanning is fast and easy. This function greatly increases your productivity. You can enjoy smooth scanning by aligning either the right side, centre or the left side of the documents. This lets you simultaneously set various sizes of documents for scanning. 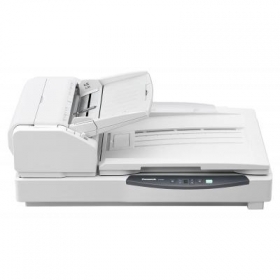 The clamshell design allows full, easy access to the entire paper path, so you can clear paper jams or clean the unit without calling a service centre. The rollers last a long time and are easy to replace when worn, also improving the unit's cost-effectiveness. Files can be named by a free combination of 20 items on the screen. This saves the trouble of typing complicated file names and also prevents file name mistakes. Background colours can be switched to black or white. Black allows the de-skewing function to correct skewed data, and white prevents backside images from being visible when using thin paper, to ensure beautiful scanning quality.